I have been wanting to crochet a few simple pull-over vests for our kids. Nothing fancy, just am added layer to wear next winter to help stay warmer. This morning, I remembered very old idea for making the vests. Best part is, no pattern is required! First step is to take measurements. Measure the child around their chest. Add 1.5 -2″ to this amount to allow room needed for pouring on the vest and wearing a shirt underneath. Next, measure from 1-2″ below the armpit to the waist where you want the vest to end. Last measurement is the shoulder from the place where the top of the vest will be from front to back. When crocheting the vest, you make 3 pieces: a tube that forms the body of the vest and two rectangular shoulder straps that are 2-3″ wide. To make the body (tube) of the vest, chain stitch the length of your chest measurement. Slip stitch to close the ring. Chain two stitches then start crocheting with your favorite stitch pattern beginning at the second stitch from hook. Continue all the way around until you reach the beginning of the row. Slip stitch to end that row. Repeat the process until the tube is the length needed for the vest measurement. For shoulder straps, make two rectangles 2-3″ wide and the length needed according to your measurement. You may want to place the vest body on the child and measure the strap length. At that time, place rope markers or a short price of yarn where the straps will be attached to the front of the vest body. This will make finishing easier later. Stitch your straps to size. Align one short end of each strap to the placement markers on the front of the vest body. Single crochet into place. Lay vest flat with front side facing downward. Align shoulder straps to the back so that they are even with the front. Single crochet into place. To finish, you can now stitch a pretty edging onto the vest if desired. Voila! You are done. A simple pullover child’s vest without a pattern. Enjoy! I have been searching Pinterest again. I am hooked on that site. The latest search has been for a no-bake granola bar recipe. Pookie just LOVES granola bars. Most recently, he ate an entire box of the Cliff bars in one sitting. It is nearly impossible to keep him in good supply of them. With that in mind, I started looking for recipes to keep him – and the rest of us – well stocked. I especially wanted to have a no-bake version that will allow me to make them throughout the summer without heating up the kitchen. I found that in all the recipes, there was a basic theme for ingredients. The liquid ingredients were nearly always the same and in the same amounts. To these were added the dry ingredients. Again, the type of ingredients were very similar in type and amount. The only true variation was in the type of cereal or trail mix added to the recipe. With that in mind, here is the basic recipe that I am making. Press the mixture into an 8×8 inch pan that has been lined with parchment paper sprayed with vegetable spray. 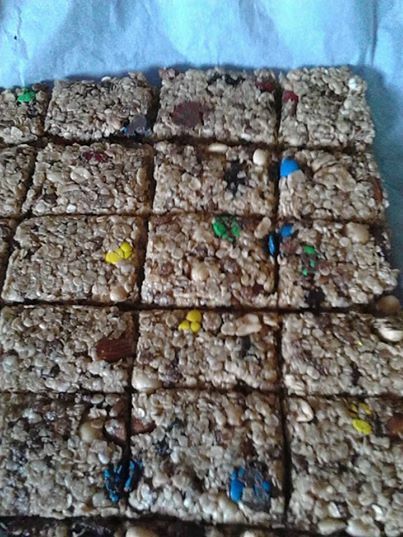 1/2 cup chocolate chips, mini marshmallows, M&Ms, peanut butter chips, or a mixture of any of these. Chill for about 1-2 hours before cutting into 12 bars. Now that you have the basics, here are a few variations that may be fun to try. Well, in recent weeks, a new addition has been added to the homestead. A stray dog showed up at the homestead. Not just any dog, but a huge one! When we first saw him, he had been walking along the state route about a mile from our home. He was wearing a collar and dragging a heavy chain. Evidently, he had broken loose and had wandered off from his home. Off and on over the next couple of weeks, we would get glimpses of him. At some point, the collar and chain had been removed. Then, a couple weeks ago we found him in our yard. Oh joy. A huge stray dog. The kids were thrilled since their dog died just before Christmas. I wasn’t sure if we should try to keep him at first until I realized just how friendly he was. I called the sheriff department to find out what we needed to do before taking the dog in as our own. In our area, there is a huge problem with people either dumping off dogs they can no longer afford or want. They also told me that it is becoming more common that families who have to move and cannot take their dog, will simply abandon the dog. 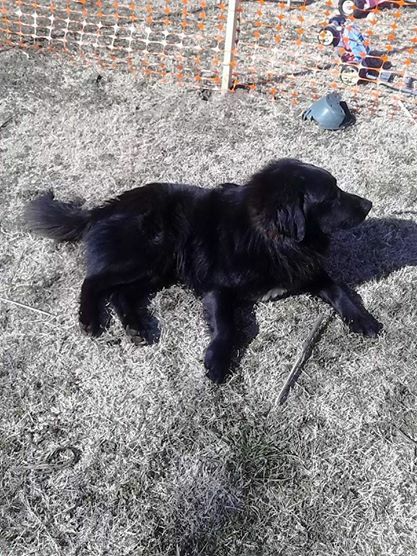 The lady at the sheriff’s office said that if no one had claimed or tried to catch the dog in the past weeks, it was likely an abandoned dog that broke its chain. If we wanted to keep the dog, simply consider it ours and let that be that. If an owner shows up, just present them with any vet bills for reimbursement. Well, it has been 2 weeks now that we have had the dog. He is so lovable. Pookie is already bonding with him. I named him Zeus. He just has that regal and powerful look about him. I was thrilled to learn that he is a Newfoundland. We are estimating his age to be about 2-3 years old. When he first showed up, he chased cars terribly on our dirt road. Now, he is calming down. He stays outdoors most of the time. At night, he keeps the coyotes away. He sleeps near our front door on the porch and hangs out with the kids whenever they are playing outside. I tried to get him indoors but he won’t come in. I did manage to half carry him into the house one day but he was happier outdoors. Training him is proving to be easy. He had no training prior to coming here. He didn’t even know the most basic of commands, such as sit. The training is going well however. Newfoundlands are very easy to train as they are quite smart. They are a true gentle giant. Very tolerant of children. Later this spring, I will take him to be groomed. Living where we do, he will get too hot in the summer with all that black fur. So, it is recommended that we get his fur trimmed by early summer. When cold weather comes back around, his fur will have grown back in time to keep him warm next winter. Zeus is already becoming a much loved family member. We are fencing in a large yard area, about a 1/8 acre in size for a play yard for the kids. The fenced area includes a portion of the side porch. On that porch, we have Zeus’ food and water dishes as well as setting up a sleeping area for him. Once completed, Zeus will be living in that fenced area to prevent him from chasing cars or wandering off. The porch area will give him plenty of protection from the weather as well. When we are out at the garden or working around the property, he will be running loose to hang out with us. Each day when the kids go outdoors to play, Pookie looks for Zeus. Being as he is a new-to-us dog, I wondered how he would respond to Pookie’s stimming. Zeus ignores it. Instead, he follows Pookie around or lays down near when Pookie is sitting. I wonder how difficult it would be to train Zeus to be a service dog for Pookie. He has the right temperament for it. Whether we do that or not, Zeus will be a great companion for the kids here at the homestead.